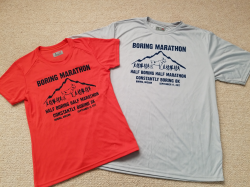 Register for Boring Marathon, Half-Boring Half Marathon, and Constantly Boring 8K Ra... today! Race stickers/window decals — $2.00 ea. 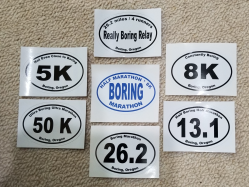 Car window decals from our 2014-2017 races. 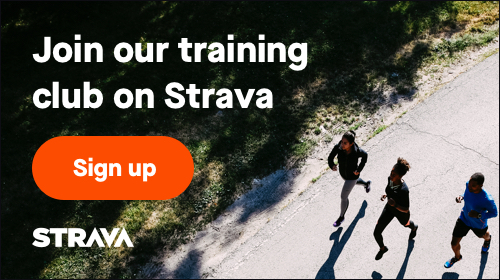 Finding America: 26.2 miles at a time — $20.00 ea. 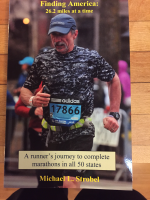 Mike's book about his journey to complete marathons in all 50 states. 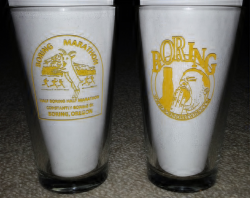 A portion of the proceeds will benefit the Boring Marathon. 2014 white cotton t-shirt — $5.00 ea. 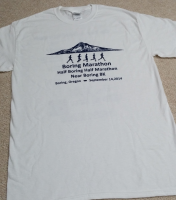 White unisex sized Gildan cotton t-shirts with navy print from our 2014 races. 2015 Tech shirts (blue and yellow) — $10.00 ea. Royal Blue A4 tech shirts with yellow print (except for men's larges which are Gildan Performance) and Golden Yellow A4 tech shirts with navy print from our 2015 races. 2016 A4 tech shirts (lime green and gray) — $10.00 ea. 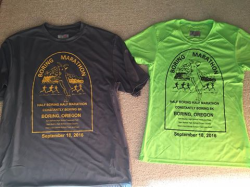 Lime Green A4 tech shirts with black print and Gray A4 tech shirts with yellow print from our 2016 races. 2017 A4 tech shirts (athletic orange and silver) — $10.00 ea. Athletic Orange and Silver A4 tech shirts with Navy print from our 2017 races. 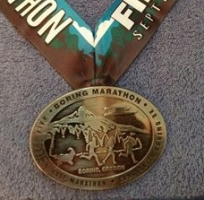 2014 medal — $10.00 ea. 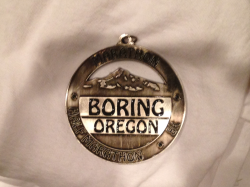 Race medal from our 2014 races. 2015 medal — $10.00 ea. Race medal with your choice of ribbon (half marathon, marathon, ultra marathon or relay) from our 2015 races. 2016 medal — $10.00 ea. Race medal with your choice of ribbon (8K or half marathon) from our 2016 races. 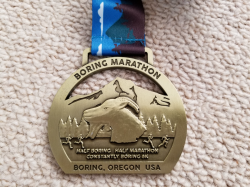 2017 medal — $10.00 ea. Race medal with your choice of ribbon (8K or half marathon) from our 2017 races. 2016 pint glass — $12.00 ea. 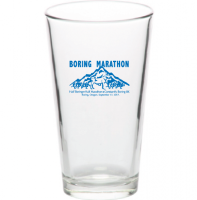 Pint glass featuring our 2016 race logo and the logo of our race sponsor, Boring Brewery. 2017 pint glass — $12.00 ea. 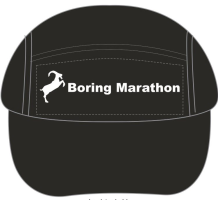 Boring Marathon hat — $25.00 ea. 2018 A4 tech shirts (red or black) — $10.00 ea. Red and Black A4 tech shirts with black or gray and white print from our 2018 races. 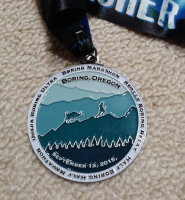 2018 medal — $10.00 ea. Race medal with your choice of ribbon (8K, relay, half marathon or marathon) from our 2018 races. 2018 pint glass — $12.00 ea.